Anti-nutrients are Nature’s little Protectors. They exist in all plants and animals, and they serve very specific and differing biological roles. The primary role is to protect the plant or animal from outside harm. When we consume these anti-nutrients, it initiates an “allergic” or immune response in our bodies, often leading to auto-immune disorders such as Gluten intolerance, Celiac disease, Leaky Gut Syndrome, Irritable Bowel Syndrome, Autism, and many others. Some people are more susceptible to problems associated with this than others, mainly due to genetic differences and ancestral history (see the Grains, Legumes, Nuts, & Seeds page). Everyone has an immune reaction to ingesting these whether they have obvious symptoms or not. The more you eat, the more damage is caused to your body, and the more effort your body expends to fight off the effects of it. By eating foods with high amounts of these anti-nutrients, particularly on a regular basis and in large quantity, you are compromising your immune system and your overall health and longevity. You are wasting your body’s precious resources and forcing it to compensate for your bad diet. Let’s look at the modern day diet. It is high in grains, legumes, sugars, grain-fed animal protein, and processed foods. It is low in good fats and proteins, and quality whole foods like fruits and vegetables (Corn is not a vegetable. Neither are peas. Neither is a potato.) So, not only are you eating high amounts of foods that inhibit digestion and vitamin and mineral absorption, we are not eating enough of foods that contain these essential vitamins and minerals to begin with. Then, we add to that bad fats, toxins from pesticides, fertilizers, antibiotics, hormones, genetically modified, irradiated, and otherwise manufactured foods. We have turned our nutrition into a chemical cocktail of non-food and bad food that depletes our bodies of vital resources and nutrients and then wonder why we see an increase in chronic diseases such as diabetes, heart disease, osteoporosis, and auto-immune disorders. It is not necessary to completely eliminate these foods strictly based on this information. However, it is recommended to take precautionary steps to reduce the amounts contained in the food items you eat, and limit the quantity of those food items. Less is more. 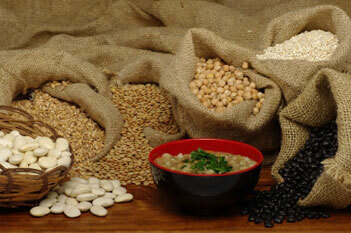 There are other reasons to avoid eating Grains and Legumes. Nuts, should be limited in quantity or avoided if they cause a problem. There are a multitude of toxins that occur naturally in our food. I am not going to attempt to provide a complete list here. Following, you will find a short list of the most common, and most toxic, substances that occur in our food. The following is a list of common Anti-nutrients. Lectins are specialized proteins that are contained in all foods, some in higher amounts than others, and they inhibit digestion. They have adherent qualities that allow them to attach to carbohydrates, cells, tissues, and organs. There are several types of lectins, and they do serve several different biological roles some of which are beneficial, some are not. For example, the human body contains lectins that allow blood cells to pass into tissues among other crucial roles. Microbes, on the other hand, use lectins to attach to host cells. Science is just beginning to understand and research lectins in depth. There is much still to be learned, but there are some aspects that we do know. Plant lectins are basically nature’s pesticide. The foods that contain the highest, and subsequently the most dangerous amounts are grains, legumes, nuts, seeds, and nightshades. They were developed for the sheer purpose of preventing animals (including humans) from eating them in too large of an amount, thus ensuring their survival. If eaten in high quantities (as our current diets contain) they cause nutritional deficiencies, digestive problems, and auto-immune responses; some of which can be deadly. Consequently, our distant ancestors ate a wide variety of foraged foods, and grains and legumes were not part of that. Nuts, Seeds, and Nightshades were eaten in very small quantities, and very rarely. Eating these foods raw increases the potential damage exponentially. Fermentation, soaking methods, and cooking can reduce the amounts of Lectins found in these foods, but does not eliminate them entirely (see below for more on soaking methods). Phytic Acid is used to store phosphorous in plant tissue. The Phosphorous content is not bioavailable for humans. Phytates are highly charged binding compounds (the little arms that grab on to things), that are the result of the acid reacting with surrounding nutrients to form a “salt”. They do have a chelating effect because they bind to metals, minerals, and other phosphate binding nutrients. Unfortunately, they also bind to nutrients such as calcium, iron, magnesium, and zinc which then depletes these essential nutrients from our bodies. They inhibit digestive enzymes as well. There are some beneficial aspects to Phytates such as removing heavy metals and antioxidant properties which help with cancer treatment. However, the majority of studies associated with these benefits tend to be strictly for controlled medical use, not as a dietary solution. The amount of Phytates in food varies depending on variety of food, where it is grown, how it is grown, and how it is processed. Any foods that are grown with commercial fertilizers high in phosphates tend to contain higher levels of phytates. When you remove portions of the food like seeds, bran, or germ (as in wheat germ), for example, you are isolating the part of the plant that contains the highest amounts of phytates. A diet high in phosphates ultimately requires high levels of calcium in the diet to give the phytates something to bind to. If your food doesn’t have it, it will leach it from your body. Vitamin D is then also leached causing severe bone deformation, rickets, and osteoporosis. Considering that many of us don’t get enough sunshine on top of all of this, makes losing Vitamin D even more detrimental. It is no surprise then, that we have become accustomed to food combinations that include grains and dairy. Even though dairy products do not contain calcium that is bio-available to us, it does allow for the binding of phytates. Interestingly enough, Phytase, an enzyme that neutralizes phytic acid, is not produced in high enough quantities by humans to counteract the negative effects. However, the “good bacteria” in a balanced and healthy gut flora environment do. This can help reduce the negative effects of Phytates, but does not eliminate them entirely. Sprouting has a similar effect as it activates phytase. We’ve all heard about Gluten, Gluten intolerance, Celiac disease, and the newest trend of “Gluten Free” products. As Zen to Fitness puts it: “Gluten is the protein in grains which mimics those found in viruses and bacteria triggering an immune response in the body.” Need I say more? There is an antibody to gluten that is created by the digestive system. As long as you eat gluten, you are putting your body into defense mode. Over time, this weakens your immune system making you more susceptible to all illness. Grains that contain Gluten are Barley, Kamut, Oats, Spelt, Triticale, Wheat (Bulgar, Durum, Semolina, etc…). “Gluten Free” products are not enough because they are highly processed and contain many other harmful ingredients. The same as sugar and MSG, Gluten is hidden on packaging under several names. For a list of foods that contain Gluten, see the links to the right. Enzyme Inhibitors are just that. They inhibit enzymes from doing their normal work. There are digestive enzymes, and there are metabolic enzymes. Enzymes are where the action is inside our cells. That’s what allows all of our metabolic processes to happen. When it comes to digestion, that means we don’t digest our food properly, and we don’t absorb the nutrients we need efficiently. For more information on how enzymes work, see the Enzymes & Amino Acids page. Alkaloids are Nitrogen containing compounds produced by bacteria, fungi, plants, and animals. They are often used in nature by plants and animals as a poison. Nutritionally speaking, they are most commonly found in Nightshades (see Solonaceae on the Fruits & Vegetables page). They are another one of Nature’s Protectors and natural pesticides. There are several different types of alkaloids, and they have different effects on our bodies. To summarize, they can negatively affect the nervous system causing twitching, trembling, breathing difficulties, and convulsions. They also cause inflammation and damage to joints, and often play a role in osteoporosis, rheumatoid arthritis, and other joint problems. There are also some alkaloids found in Legumes. Cyanogens (as in Cyanide) are toxic odorless gases. They are poison. And guess what, they are in our food. The highest concentrations can be found in legumes, particularly Lima Beans (no wonder we hate eating them as kids!). There are no health benefits to consuming these dangerous compounds. Should we just stop eating Grains, Legumes, Nuts, and Seeds? Don’t I need those in my diet? This is a tough question. The short answer is not if they cause problems for you; and not if you are interested in long term health and longevity. What? No Nuts and Seeds? Everything in moderation. I address all of these questions in detail on the Grains, Legumes, Nuts, & Seeds page. My personal preference is to avoid grains and legumes, and eat nuts and seeds sparingly. Sprouting, is the best option in this case. Quite frankly, I’m just too lazy to sprout grains and legumes, and it is still unclear how much this reduces the amounts of anti-nutrients within them. It’s not worth the potential toxic load to me. I do see the benefits in nuts and seeds, but am very careful to limit them to small quantities. If you do choose to eat these foods, be sure to prepare them properly to limit the amount of exposure to these anti-nutrients. Also, limit the quantity and frequency of consumption. Soaking and/or sprouting grains, legumes, nuts, & seeds can at least reduce the amount of these anti-nutrients, but usually does not completely eliminate them. It does have many other benefits, however. Soaking in water with salt often neutralizes enzyme inhibitors. Changing the water often and keeping it a warm (not too warm) temperature helps to get out much of the toxins. I have seen many different recommended soaking times, temperatures, and methods. I have yet to find scientific evidence of the timing results of this, so I will refrain from any definitive recommendation. I do know that sprouting is a good sign beneficial metabolic processes have occurred. Once sprouting begins, the food becomes “alive.” The enzymes go to work to increase vitamin and nutrient content, the anti-nutrients begin to break down, and the bio-availability and digestibility increase. Be sure to dry them properly, however, to avoid mold growth. Fermentation is usually a process added to the Soaking process. It usually occurs after soaking and grinding, and is mixed with a culture(s) in order to start the fermentation process. This method furthers the deactivation of anti-nutrients and enhances the nutrient content. It can, however, cause some problems with Candida, so caution should be used. I personally avoid most Fermented Foods due to the processing and health risks associated with them (see the Elimination Diet page). Many of them contain harmful microbes. Some are made from grain sources, and most cause spikes in blood sugar. Some fermented foods may be tolerable, and some may not. When in doubt, avoid them. Lectins: Do They Cause Disease? Phytic Acid: What is it?